It was the best of times. It was the worst of times. That pretty much summed up the era of the mid-1920s to mid-1930s. A combination of the boom and bust era of The Roaring 20s, the stock market crash, and the Great Depression left early Radio listeners clinging to their fondest memories while they awaited some relief from the American economy. The familiar songs and hymns of the era were an even greater source of comfort and reassurance to millions of Americans of the era. Sheet music, for those with the means to employ them, was one of the less expensive diversions available to the vast majority of the population. 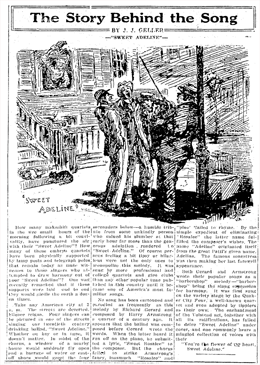 Recognizing the resurgence of interest in America's fondest musical standards, the newspapers of 1925 and 1926 published a highly popular feature titled, The Story Behind The Songs. The articles were first published and illustrated by the M. Witmark & Sons music publishing house, a prolific sheet music publisher from the turn of the century. Presumably having noted the popularity of the weekly, syndicated feature, the Transcription Company of America (Transco) undertook a thirty-nine episode series of vignettes very similar to the syndicated print feature, with the added advantage of dramatizing the stories and playing the popular standards with a full orchestra and chorus. Transco marketed the series to large and small stations--and networks--alike. NBC-Blue's WJZ, New York, was the largest of the networks of the day to broadcast the series. Beginning in May of 1930, the syndication was airing in small market stations throughout the midwest. By 1931, NBC-Blue was broadcasting the series as filler for their 10:00 p.m. nighttime Wednesday or Thursday slot. All thirty-nine episodes aired throughout the midwest as late as February 1931 during their first runs. The syndication was also broadcast throughout 1931 and 1932 by several small market stations. 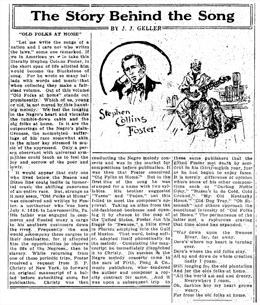 The songbook of Stephen Foster was repeatedly tapped for six of the standards dramatized. Popular hymns and favorite military songs were the next most represented songs. Patriotic standards such as La Marseillaise, Hail Britannia, The Star-Spangled Banner, and The Battle Hymn of The Republic were among the seven national songs highlighted during the series. The series also recounted the history of some of the more obscure popular songs throughout history, such as the college song, Upidee, Upida and some of the popular British Empire songs of history. Run Dates(s)/ Time(s): 30-05-14 to 31-02-04; NBC-Blue; Thirty-nine, 15-minute programs; Wednesdays or Thursdays, 7:30 p.m. to 11:00 p.m. depending on the market and station. The Hickerson Guide is predictably inaccurate--it's cited dates off by exactly one year. We'd like to have cited an entire 'as broadcast' log, but it would seem that NBC-Blue, over station WJZ, only broadcast The Story Behind the Song on an occasional basis between 1930 and 1931. The 1930 run, while supported by contiguous grid listings provides no titles for the run. The 1931 run of only a few weeks, cites only a handful of titles then disappears. We could have simply lied about this series like everyone else in the otr community has, but we simply don't have the stomach for that nonsense. "Wishful thinking" simply isn't good enough. We've cited the earliest known broadcasts below, while adding a corrected catalog of the series employing the stated Transco transcription numbers from radioGOLDINdex. Until we determine a second provenance for the transcription numbers, we've left them color-coded as provisional. Bogus Encoding Alert: virtually all circulating collections of The Story Behind The Song are up-encoded from their original 64-bit encodes to 'fake' 80-bit encodes. This practice renders an identical-sounding recording with the identical sound wave characteristics and content but wastes almost 2 Mbs of storage per recording. The nominal size of a 15-minute, 64-bit .mp3 recording is about 7 Mbs. Whoever's engaging in this practice is simply attempting to give the appearance of a higher quality encode to a nominally encoded 64-bit .mp3. Buyers and downloaders beware. We encounter frauds like the above day in and day out circulating throughout the otr community. In the 'race to the bottom,' apparently it's 'no-holds barred' now. This is most certainly not vintage Radio preservation. It's simply yet another of millions of online and eBay vintage Radio scams on a par with 'Nigerian inheritance' scams. The more hang-time podcasters can trick naive downloaders into wasting, the longer they can bombard you with all their ads and banner exchanges--all the more opportunity to generate income on their 'free downloading' and 'free podcasting' sites, at your expense. And of course you end up filling up your iPod or other portable device with as much as 48 Mbs of wasted storage in the process. 8:30 o'clock tonight over KQV. Lowther, assisted by Sylvia Sconza, soprano, also will be heard at 7:30 o'clock in the "Story Behind the Song" dramatization. "You Brought a New Kind of Love" is the musical selection to be used for the "Story Behind the Song" broadcast over WENR at 8:45. WJZ--New York--10:00 p mStory behind the song, Marseillaise. In place of story behind the song on, WJZ and stations at 9:00 broadcast. from banquet to 28 American mayors leaving for Paris to attend international colonial and overseas exposition. 10:00 P. M.--Farewell Dinner to American Mayors Sailing for French Colonial Exposition on Ile de France. Speakers, Paul Claudel, French Ambassador; Mayor Walker and others--WJZ. WJZ--Story Behind the Song, "Home, Sweet Home," WJZ hookup, 9.00. WJZ--New York--10:00 p mSir James Hopwood Jeans dinner. 10:00 P. M.--"Modern Theories of the Universe," Sir James Hopwood Jeans--WJZ. 9:45 P. M.--Gandhi Testimonial Dinner, Hotel Astor. Speakers, Judge Daniel F. Cohalan, Sailendra Nath Ghose and others--WOR--(WJZ at 10:00). 10:00 P. M.--Dinner to Ryder Cup Golf Teams at Columbus, Ohio. Speakers, Governor George White of Ohio and others--WJZ. Story behind the song, "Men of Harlech," WJZ-NBC, 9:00. Story behind the song, "Silent Night," WJZ-NBC, 10:00. 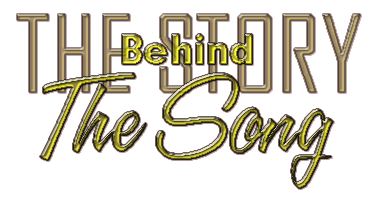 Story behind the song--WJZ-NBC, 10:00.